A concentrated and alkaline version of our Fulvic Minerals. Chelated from ancient plant matter rich in essential minerals, trace elements and amino acids, it is known to be the most bio-ionically transferable natural material in the world, and is absorbed and utilized by the body and cells rapidly and effectively to enhance mineral and trace element uptake. 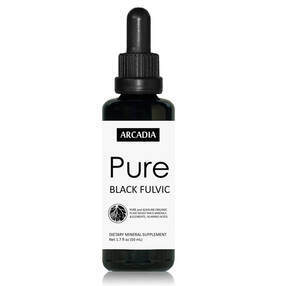 Pure Black Fulvic may also safely and effectively detoxify the cells while delivering its complex of vital trace minerals. Our organic Great Trace Superionic Minerals are derived from prehistoric plant matter. The ionic trace minerals are extracted using a cold process to create a liquid supplement that contains one of the most powerful nutrient transporters found in the natural world. Our Fulvic Acid makes cells more permeable and receptive to nutrients. The organic proprietary liquid fulvic acid formulation naturally containing over 77 trace minerals, trace vitamins, 18 amino acids, and an abundance of other beneficial naturally occurring organic source phytochemicals and constituents that are nature's way of helping your body.